We felt our premium uke category was in need of a big shake up, so removed four existing models – including the Lanikai TunaUke and Fender Mino’Aka – and replaced them with the excellent Lanikai QM-BLCEC, and the curious Martin 0X Bamboo, as well as two solid choices in the Kala KA-KTGE-C and Oscar Schmidt OU55CE baritone uke. While the ukulele is an instrument often associated with the lower end of the market (i.e. you can actually pick up something pretty good for under $100!, cheaper ukuleles don’t always cut it with experienced, serious musicians. Who Actually Wants a $500 Ukulele? That’s why we’ve put together this page, focusing solely on the higher end of the ukulele market, aimed at ukulelists with more than a passing interest in the instrument. Like those who write songs and music, and perform and record with their uke. Of course, there are a handful of ukuleles that span into the region of $1,000 to $1,500, but the majority of the premium ukes in today’s market can be found for around $500 or under. Naturally, there is a good range to consider, but our chart below looks at five excellent high-end ukuleles that prove the most popular, focusing on at least one from each soprano, concert, tenor and baritone size categories – a good snapshot of the current market. Excellent tonewoods and craftsmanship combine on this high-end uke. Sound, style and playability are top-notch on this Martin soprano. A little taste of Hawaii wherever you go! Our current favorite in this premium ukulele chart is the stunning QM-BLCEC from Lanikai, which is part of the brand’s ‘Sun, Sand and Surf’ series (no prizes for guessing which aspect this uke is inspired by!). With a concert size, the body is made entirely of quilted maple laminate and finished in a high-gloss translucent blue stain for a mighty first impression. The neck features a slightly bigger width, resulting in excellent playability for beginners and experienced ukulelists alike, although it will appeal more to the latter thanks to the electronics. As we highlight in the complete Lanikai QM-BLCEC review, the Fishman preamp and controls combine for a versatile plugged-in experience, well-worthy of stage performances. There’s an all-round feeling of quality when you pick up the OU55CE – a distinctive baritone model from Washburn subsidiary Oscar Schmidt. It looks great, and the brand has added a little flair to the laminated Hawaiian koa body, finishing it with gloss, abalone rosette and binding, and a sharp cutaway that improves access to the highest frets. It’s certainly a performance uke, with a fast, wide nyatoh neck and 19 frets, while the Belcat electronics offer a superb natural replication of the uke’s acoustic tone. You can also find it as a bundle on some marketplaces, which adds to the value. Be sure to check out the full review of the Oscar Schmidt OU55CE for all the details. Cordoba is a name associated with premium classical instruments, and this handmade tenor ukulele from their 30 Series is certainly one of the more high-end we feature on this chart. The brand use Spanish building methods to produce a very fine ukulele indeed. Solid dark Indian rosewood on the back and sides complement the lighter solid Sitka spruce on the top of the body, giving this uke striking visuals and a rich, well-balanced tone. The mahogany neck comes with a rosewood fretboard, with a total of 18 frets and slightly wider nut width – perfect for those with bigger hands. 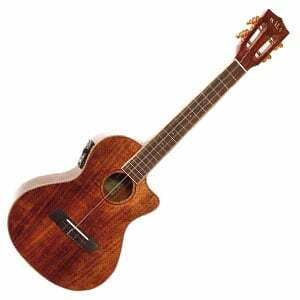 You can check out more on this delightful ukulele in our full review of the Cordoba 32T. A wildcard for this higher-end list and an appearance by Martin, who have produced a soprano ukulele that will split opinion – you’ll love it or hate it! The reason being, the extrovertedly-colored 0X Bamboo barely features any real wood. Instead, a high-pressure laminate makes up the body while more laminated woods make up the neck – we have more details on this in the 0X Bamboo’s full review. However, this eco-friendly uke still shows off superb playability and craftsmanship, while the sound is akin to a solid wood soprano, with plenty of jingle and a very good projection. The hardware also complements the tone and playability of an all-round impressive uke. With their KA-KTGE-C, Kala offers players a traditional taste of Hawaii – with a few performance-focused aspects that make it suitable for every level. These include the generous Venetian cutaway, the super-playable glossy mahogany neck, and – perfect for stage performances – reliable electronics. These come in the form of the Belcat UK-300T, with 2-band EQ and a built-in tuner. The uke itself is made entirely of beautiful hand-selected Hawaiian koa laminate, with a gloss finish and elegant maple binding, as we highlight in the complete Kala KA-KTGE-C review. The hardware, such as Grover tuners and a NuBone nut and saddle, keep this tenor playing and sounding great – mellow, balanced and consistent, both plugged and unplugged. Perhaps a better question – who doesn’t!? However, the more expensive ukuleles tend to be favored by the more serious ukulelist, whether that’s an experienced player or a professional musician. These players can appreciate the intricacies and qualities of a premium uke, and would benefit from the advanced technology and better tonewoods on offer. That’s not to say someone with no experience or intermediate player wouldn’t enjoy a premium uke. In fact, given the right ukulele, it would be an advantage for a complete newbie to play on a ukulele that felt smooth as butter, with a perfect tone and beautiful looks. It would help them practice and improve quicker than learning on something that cost twenty bucks, that’s for sure. However, some of the advanced features on these high-end instruments – whether that’s electronics or adjustable intonation – are just not necessary at lower levels of playing. If you are just starting, you’d probably be better off with something that features in our guide to buying a ukulele, which offers advice as well as a chart on the best ukuleles for beginners. As we arrive in the premium category, you can demand a lot more from your ukulele. For example, on an entry-level ukulele, you can forgive plastic components, rough finishes, and a sharp fret here and there. If you’re paying up to $500 for a uke, there’s little room for error from the manufacturer. Ultimately, when spending a good chunk of dough, you want a ukulele that plays smoothly, sounds exceptional, feels flawless in construction, and has the wow factor – whether that’s a soprano, concert, tenor or baritone. In a nutshell, it should look and sound near perfect. When it comes to the wow factor, this is usually down to the interestingly grained woods and decorations, like rosettes, purflings, and inlays. Of course, more standard tonewoods like mahogany and spruce are used in body construction, but you’ll also see some more exotic woods in use. Koa is more popular in this range – with its wonderfully warm tone and luxurious grain – as are woods like Hawaiian Mango and Monkeypod. Needless to say, you’ll also find more use of solid woods in the bodies, although some all-laminate models still appear. Like lower-priced categories, having electronics on your uke will still depend on your aspirations. Are you performing? Are you recording? If so, the pickup and preamp systems on ukes in this range should be top notch, with 3-band EQ, built-in tuners, and – in some cases – have digital connectivity capabilities. Across this site, whether buying an electric, an acoustic, a classical or a bass guitar, we always advise that buying used instruments can have great benefits – if you are careful. And buying a used ukulele in the sub-$500 price range is no different. You can find a used model for a couple of hundred bucks less that you’d pay for it new, depending on the age and wear of the instrument. You can even find some great value genuine vintage instruments, if that floats your boat. Bargains are to be had when buying used. However, if this is the route you go, make sure that you are able to thoroughly test the ukulele before buying – both playing it, to ensure it sounds as you’d expect, as well as inspecting it for any damage. This is particularly important if electronics are involved, as you’ll want to plug it into an amp for testing. If you can’t test the ukulele for any reason, make sure you purchase from a reputable online store, such as Amazon or Guitar Center, where fair returns policies are clearly outlined. 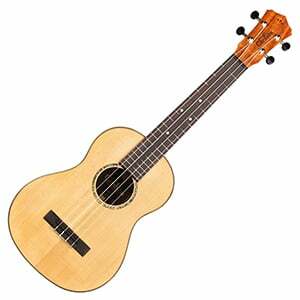 Buying a ukulele, especially if you are an experienced player, shouldn’t be too difficult. But when dropping up to half a grand on a single instrument, you want something that will not let you down – whether recording or playing on stage, or just relaxing at home. So make sure you don’t rush your decision. Create a shortlist of your favorites, read plenty of reviews, watch videos, and – if possible – test out your potential ukuleles in a local guitar store. Your perfect premium uke is out there – good luck!